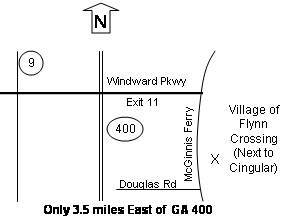 We're conveniently located in the Flynn Crossing Village (anchored by the Publix grocery store) at the intersection between Windward Parkway and McGinnis Ferry Road. We are located near WellsFargo Bank and Great Expressions Dental. Our practice is located in Flynn Crossing (anchored by Publix). We are next door to Cornerstone Academic and Great Expressions Dental. Don’t hesitate to call us if you are unsure at 678-297-7575.